How about a breathtaking view from the 31st floor of World Trade Centre while you learn to make some easy stir fry dishes? I have experienced this recently at the Stir Fry Class by Executive Chef Myo, Chef Rabi Singh, and Chef Santosh at the most beautiful location in Bengaluru - High Ultra Lounge, Malleshwaram. 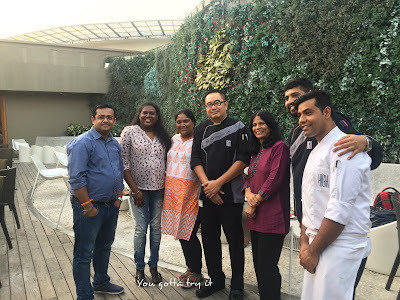 I love Pan-Asian stir fried dishes and when I got an invite to attend this culinary session, there was no reason to say no! 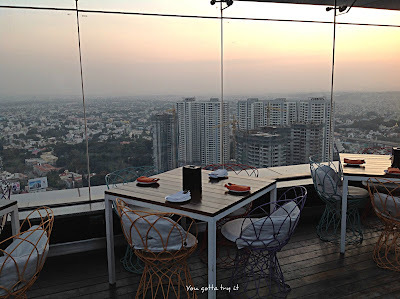 This was my first visit to High Ultra Lounge which is located on the 31st floor of World Trade Centre, Malleshwaram. They have valet parking, so not to worry about finding a parking in between the hustle and bustle of that side of the city. Your 'Wow' moment starts soon after you enter the lift counting the floors. 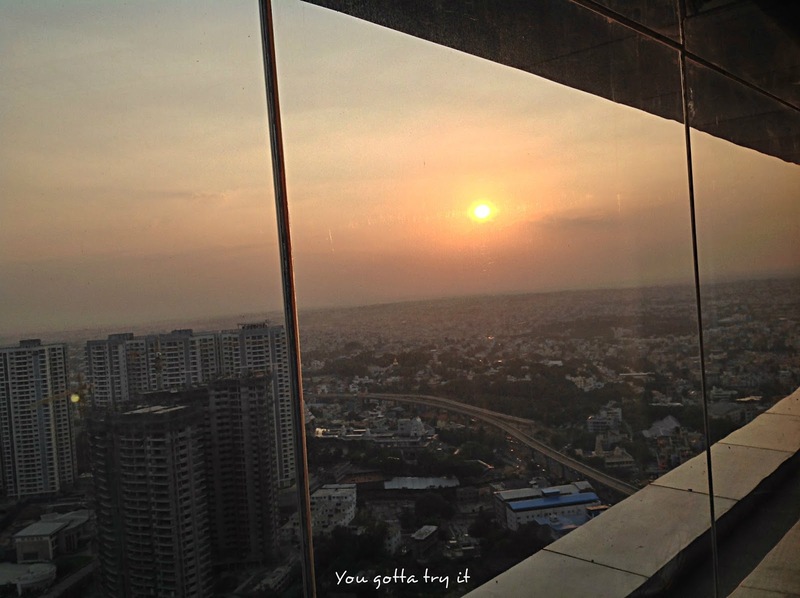 This luxurious lounge is the highest lounge in South India and its 421 ft high. The beautiful view from the lounge is not so very common scene in Bangalore. High Ultra Lounge offers delectable Pan Asian food and chefs from High showed us how to make some of the best stir fries by sharing some of the tricks and techniques from their kitchen. 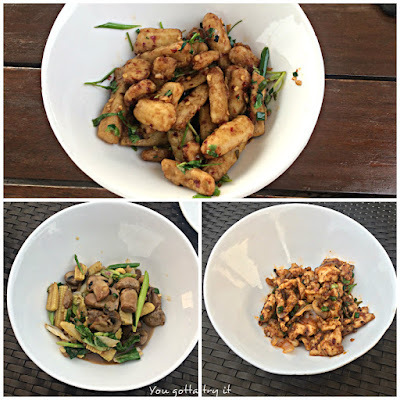 The three stir fry dishes - Baby corn Eggplant, Chicken in Black Bean sauce and Long Beans with Soy Garlic sauce were on the menu for the culinary session. 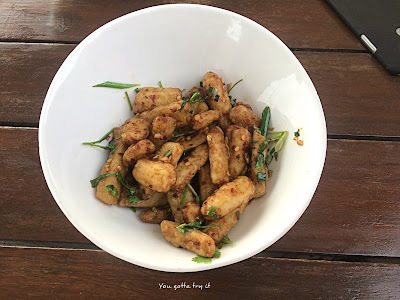 Baby Corn and Eggplant; a match made in heaven! This veggie delight is a perfect starter for any party. It's so easy to make and tastes awesome. Slice Baby corn and Eggplant into thick julienne. Coat the vegetables with corn flour, water and a pinch of salt and leave it aside. 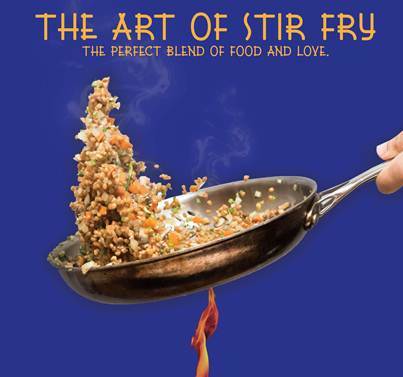 Heat oil in a wok and deep fry the vegetables by adding one by one. Heat sesame oil in a heavy bottomed pan and chopped onion, garlic, chili flakes, butter and sauces. Add the fried veggies and chopped coriander and toss well. Chicken in Black bean sauce is one of my favorite dishes. I didn't know it's very easy to make with few ingredients which are easily available. Roughly chop the black bean and keep it aside. Add corn flour to chicken pieces by adding a little bit of water and salt. Deep fry the chicken pieces till golden brown and keep it aside. For sauce, combine all the sauces and wine along with chilli flakes. Heat sesame oil a wok and add the chopped ginger, garlic and saute well. To this mix add the chopped onion and fry till onion becomes soft. Add black bean, prepared sauce and cook on slow fire till it's done. Heat oil in a pan, then add chopped ginger, garlic, onion, and fried chicken pieces. Saute well. 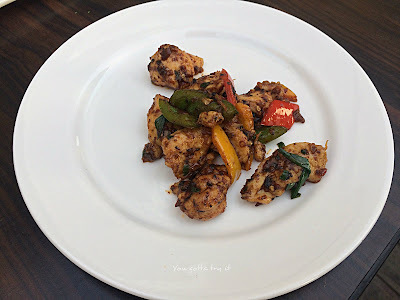 Combine the prepared sauce along with chicken and stir fry along with bell peppers. Long Beans with soy-garlic sauce and veggies were cooked to perfection. 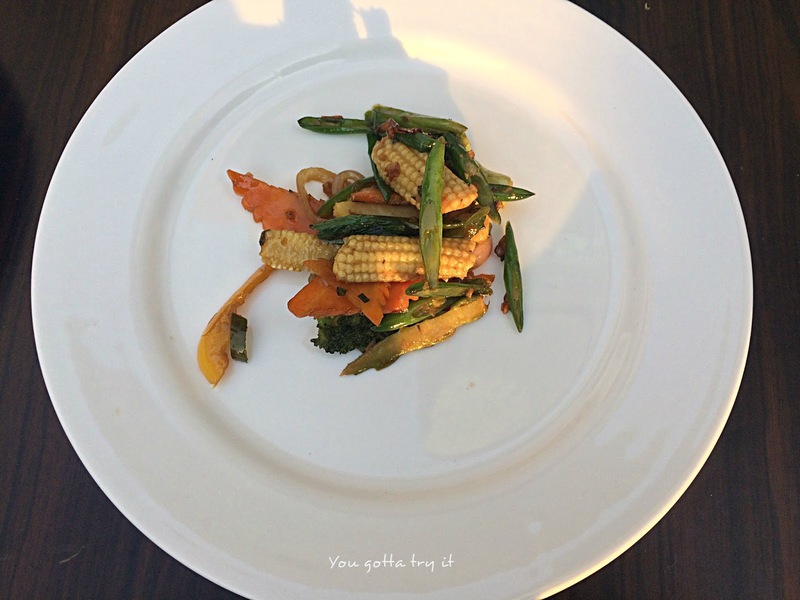 Can't get enough when super tasty and nutritious vegetables like broccoli, lotus stem, baby corn and long beans are in one bowl. Combine all the sauces along with wine, chili flakes and keep it aside. Blanch the veggies for less than 20 seconds. Wash and drain it in cold water. Heat oil in a wok and add chopped garlic and saute well. To this add chopped onions, bell pepper, lotus stem and fry till it's done. Then add the blanched veggies, salt, sugar and the prepared sauce. Combine well. Stir fry for few mins and serve hot with fried rice or noodles. 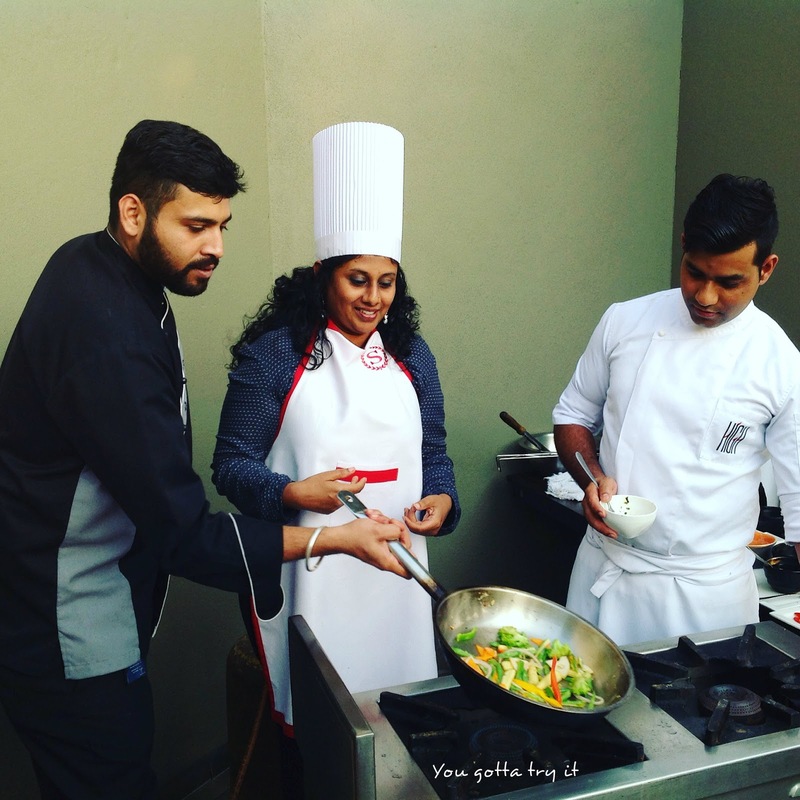 The team from High made sure that audience can also be part of cooking and for each step; they were giving guidance for the participants. I had a great time by learning, clicking and tasting the stir fries. 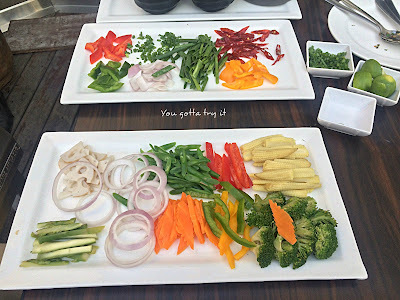 All the stir fry preparations were so good that it vanished from our plates in few seconds. The 'Art of stir fry' class at High Ultra lounge was really helpful and I can't wait to try all these at home. We enjoyed these dishes with their in-house drink, Orange Slush. 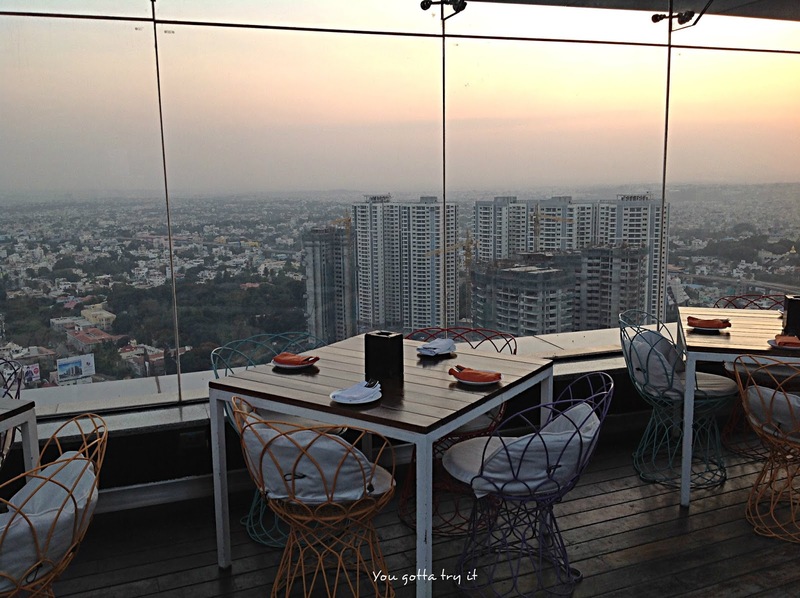 By the time we finished our culinary session it was almost sunset time and the view from High was so mesmerizing. Big thanks to Chef Myo and his team for a wonderful evening. 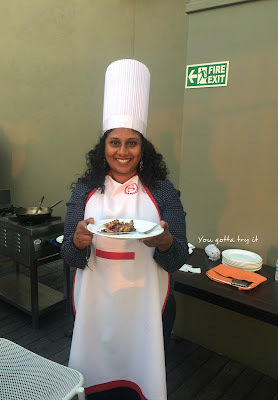 To know more about the culinary session, check out the YouTube video made by my blogger friend, Vidya Lakshmi and don't forget subscribe her YouTube channel for interesting recipes.